When I read church leadership blogs, reference church leadership articles, or see the quotes and podcasts making the rounds on social media, I can’t help noticing how “strong leadership” is highly desirable for churches. Strong leaders are organized, have a clear vision, listen well, and keep their teams moving forward. Strong leaders equip others for ministry, train new leaders, and always prepare for whatever else is coming down the pike. I mean, they also make time to pray and try to stay humble, but don’t forget they get alignment on their teams, properly onboard their staff, and make killer agendas for meetings. They know what they can’t do well and delegate to maximize their effectiveness. A strong leader can initiate change, becoming the face of major initiatives. They communicate clearly, and they sometimes bear criticism, whether it’s fair or unfair. If strong leaders are high capacity and successful, their flaws can be explained away as “quirks” or smaller matters that must be endured for the sake of the greater good. If a strong leader can reach more people for the Gospel, grow the church, and expand the ministry, then surely they can’t be held to account for some temper tantrums, power struggles, or making inappropriate remarks to their staff or congregation, right? Leaders become icons for our ideal selves. They model what we want to become and lead us to where we want to go. We want strength, purpose, direction, and influence. Sure, we would prefer that our leaders also remain humble and kind, but the more they deliver, the less urgent these virtues become in many church contexts. It’s hard for us to imagine a leader proudly boasting of his/her weaknesses today as Paul did (2 Corinthians 11:30, 12:9). It’s hard for us to imagine leaders emptying themselves of their power and influence much like Jesus did when he came to earth. It’s so easy to get leadership, influence, and power wrong. And even if church leaders can point us to chapter and verse proofs for certain offices in the church, the truth is that we have a wide range of high and low church leadership models that all claim to be based on the same Bible. Who is to say which is the best or most faithful to God’s intentions? I’m not so sure that a particular model is going to save us. Perhaps we could take the models we already have and ask something very simple of our leaders and ourselves: weakness. What if we let our leaders appear exactly as they are in their weakness and fragility? What if leaders felt free to tell us exactly how weak they are without fear of repercussions? My guess is that such a suggestion makes the anxiety of many pastors go up a few notches. Why is that? Why is weakness and vulnerability such a liability when Paul boasted of his weaknesses and Jesus emptied himself of his power and heavenly glory to stand among us? The average Christian in a church probably needs to expect “less” out of a pastor, not more. I mean that in the sense that pastors and other ministry leaders experience the same temptations, desires, frailties, doubts, and frustrations as all of us. They aren’t on a special fast track to holiness. Some pastors may have dedicated more time surrendering these weaknesses to God because of the weight of their offices, but each pastor starts where we are. As a Christian writer who encourages others to pray, I face my fair share of struggles to maintain my daily spiritual practices. Each new school year in our household brings a new schedule and fresh challenges to fit silent contemplation, the Examen, praying the hours, and spiritual reading into each day. Without daily silence my anxiety comes roaring back. Without the daily hours, I become self-reliant and self-focused. Sloth and the path of least resistance become appealing as I seek to check out from life rather than to remain engaged with God, my family, and my responsibilities. 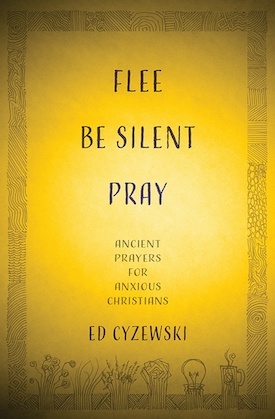 It doesn’t take a lot to send me off course, and the urgency of my writing about prayer comes out of the deep need I have for these practices. My weakness prompts me to write as I do, not my strength. If anything, I often feel like a little cork bobbing around in a stormy sea, and my only hope is in God’s intervention to speak, “Peace, be still!” over my life. I can’t get myself back on track. I can only turn to God’s mercy. I have a choice each day to surrender to God rather than to devote myself to the pursuit of my own comfort or my own entertainment. The more I’m focused on my weaknesses, the more likely I am to depend on God’s help. Our tendency to focus on a leader’s strong organizational and interpersonal strengths can make it easy to overlook what those strengths may be hiding. Those weaknesses will come out to the light one way or another, and the sooner we face them in light of God’s mercy, the “stronger” we will be in the Spirit. Well said, as always. My suspicion is that “strong” is code for male and “weak and fragile” for female. Just read the CBD catalog and notice the titles under men’s topics–strength and courage–while women’s pages are about joy in the struggle. Book covers for pastors show men climbing mountains, while women’s Bible study books have teacups and flowers. Jesus ripped up the boxes we put people in, and the church rebuilds them to keep things neat and orderly. Keep writing, my friend.